I was glad to finally be out of the barracks and away from Centurion Markus. It’s not that I particularly hate him or anything, I will simply never be able to get along with him. Pulling the oversized hood of the ‘White wolf winter cloak’ over my head, it came down to just above my eye level, covering about the top quarter of my vision. Some strange icons appear in the top left of my vision, an outline of a person with a question mark in it and a figure of a stopwatch, I figure these are the mask identity and slow enchants currently on me. It was certainly odd however as I don’t feel like I had been slowed down, at least not until I tried running and felt like all the air surrounding me at become a thick mud, to the point where moving in any direction was incredibly difficult. Understanding that this was the feeling of being ‘slowed’, I returned to walking for the duration of the time it took to enter the central courtyard. I had only taken a few steps out of the church when an old man appeared. He was a little shorter than me, long white hair, and a staff decorated by a blue crystal the size of my hand at the top. I tried to alter my direction to walk around him, but he seemed to move at the same time and just kept getting in my way, preventing me from moving forward. This guy apparently wasn’t going anywhere before talking to me. It was 5 years ago, Autumn 2021 that it was released. The virtual reality headset simply called the V-Link, nicknamed VL for short, created a massive storm around the entire world with its endless possibilities of allowing people to enter virtual space using an avatar that you control as your own body. A simple black helmet with a visor on its face tinted dark enough that you could see out of but nobody could see in, intercepted and blocked all conscious neural signals at top of the spinal cord in the neck. Two strips of LED’s on the right hand side above the ear indicated wireless signal on one strip and the other indicated power, connection and data loading status. 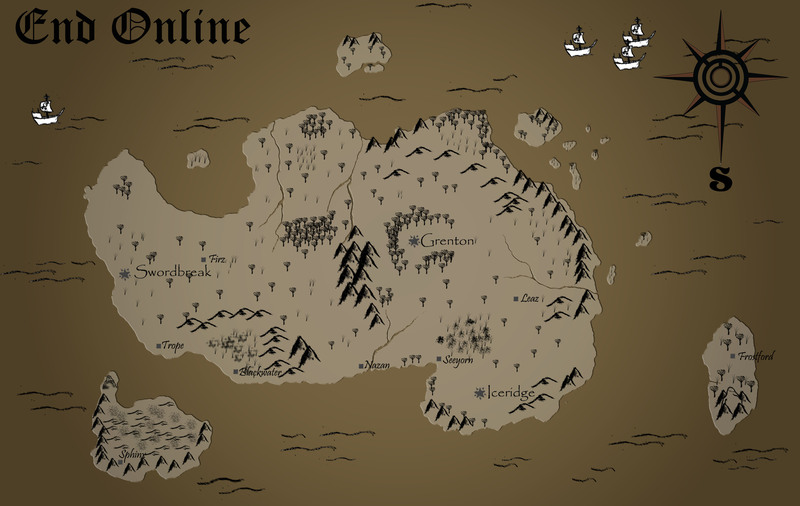 A world map of the game is now done, this will not only help me direct the characters around, but it will also help you see where they are going. My planning of the game is.. let’s say, 73.4% complete. Don’t ask how I got that number, I just pulled it out of my bat cave. This map will get its own dedicated page for everyone to easily look at and admire what a beautiful piece of artwork it is, please, no need to shower me with praise. Disregarding the jargon, the next step to do is to work on the real world outside of the game, as that is going to have a good part of the novel as well. I have some big ideas that could really help to give this story a great mood which you should find easy enough to immerse yourself in. Writing is planned to commence within 48 hours and until then, please, enjoy this piece of eye candy. The deadline I have set for chapter 1 will be 14 November 2014 and after that a schedule will be put in place after determining how roughly how long each chapter will be, probably in the middle of a full novel such as moonlight sculpture and short chapters like Tate no Yuusha. So now you know how long to wait! until then, check in from time to time as I may be sneaky and post early! Also I apologize for any ads until I have some funds they may or may not appear.